Steven is 20 years old and lives with his mother and two sisters. The family usually cook outside on a fire made from wood. However if it’s raining they cook inside on a jiku and charcoal is used. Charcoal is expensive so Steven and a friend were trying to make charcoal themselves by burning wood. His friend suggested that rather than using plastic to ignite the fire, they would use petrol. But this had disastrous consequences because the wind caught the huge flame and it turned towards Steven. He arrived at the clinic with first degree burns to his hands and forearms and the lower half of his legs suffered second and third degree burns as he turned to run away from the flames. Fortunately the top half of his legs and feet were protected by his trousers and shoes but he also had burns to his face. At the clinic the burns were regularly cleaned and burns ointment was applied daily. He was incredibly stoic as this painful procedure was carried out and he spent nine days as an inpatient and then attended the clinic every two days as an outpatient to continue to have the burns cleaned and new dressings applied. 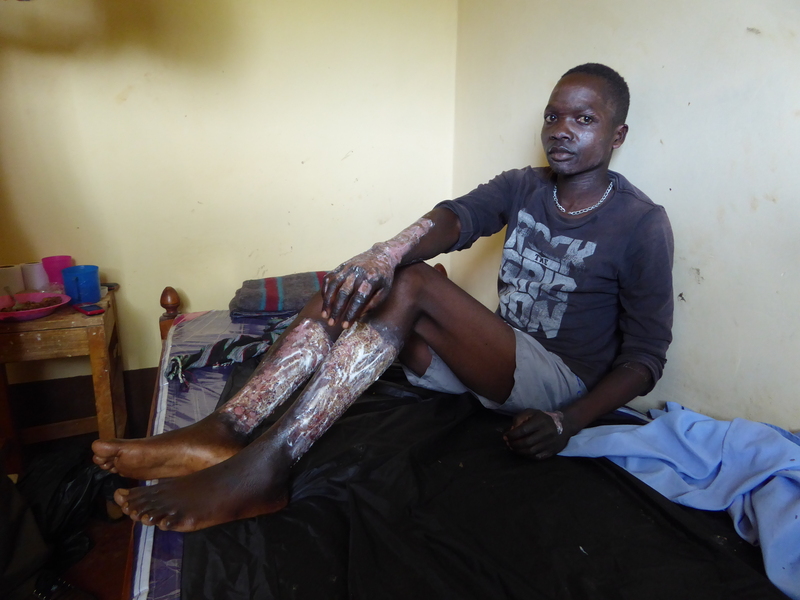 If it wasn’t for the treatment Steven received at the clinic, the outcome could have been much more serious but fortunately for him the burns did not become infected and he recovered well.